When not helping with the day-to-day operations of the MakerBus, Ryan enjoys having fun with technology. 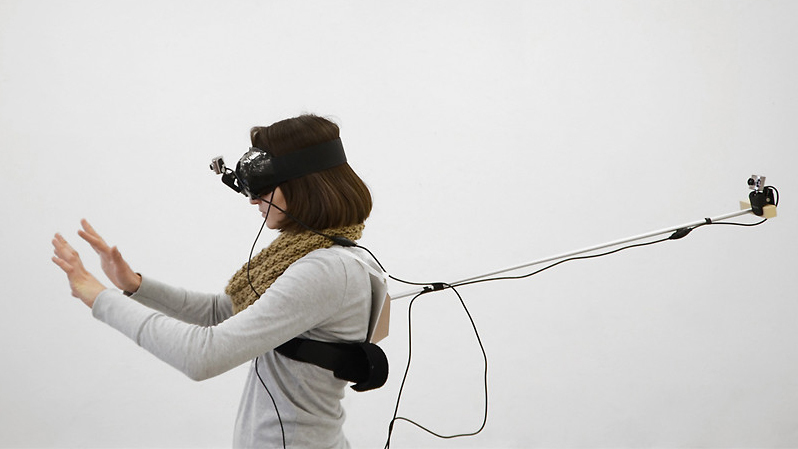 His MAKE London submission, the 3rd Person Camera, gives its wearer a truly out of body experience. Using a behind-the-back mounted camera and a head-mounted display, the 3rd Person Camera makes the wearer an avatar in their own life, transforming our normal first person perspective into a third person view. Imagine a standard third person video camera – in these games a floating camera shows the avatar from behind, giving the player the ability to move their avatar through space from the third person perspective. This camera gamifies your life by replicating this experience. You quite literally become your own avatar. The 3rd Person Camera seeks to challenge our normal experience of reality, allowing the one to live outside of oneself for a few moments. Immediately upon wearing the camera, the user will notice just how much this new perspective changes how they navigate the world. It’s common for first-time wearers to stumble around as they re-learn how to walk and move in space. During the MAKE London Fashion show Ryan will be wearing his camera down the catwalk. After the runway portion of the evening Ryan will offer demos of the 3rd Person Camera, giving attendees the chance to see themselves in a new light. If you want to alter your perspective, join us March 20th for the MAKE London Wearable Technology and Made Clothing Fashion Show, the first event of its kind in London. Tickets are available for $10 in advance or for $15 at the door. More information can be found on Museum London’s website.